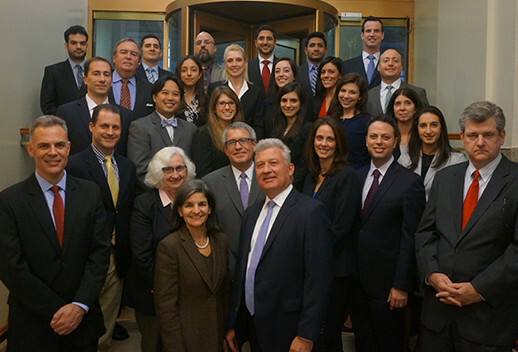 Morris Duffy Alonso & Faley is one of the most established insurance defense firms in New York City, having been founded in 1952 by John E. Morris. In its 66 year existence defending insurance cases, the firm has been involved in every conceivable kind of negligence case and tort claim. MDAF possesses the strengths of a large law firm — substantial legal resources, experienced attorneys, and a record of trial success — with the practical efficiencies of a boutique practice. MDAF regularly handles matters venued in all counties of New York and New Jersey, and we are presently expanding our practice into Connecticut. We are, however, capable and comfortable in other jurisdictions and have represented our clients in matters in various states across the country. In addition to our extensive practice in the state courts, a significant portion of our practice is based in federal courts. A sample of the firm's clients include: Acstar Insurance Company, New York City Transit Authority, Travelers Insurance, The State Insurance Fund, Utica National Insurance Group, State Liquidation Bureau, Medical Liability Mutual Insurance Company, Vermont Mutual Insurance, GEICO, MVAIC, Maryland Auto Insurance Fund, F&L Claims, York Scaffolding, Great American Insurance Group, North American Risk Services, Clarendon Insurance Group, Progressive, First Mercury Insurance, Markel West Insurance Services, Chubb Group of Insurance Companies, Arch Insurance, Avis Budget Rent-A-Car Systems, York Claims Service, Global Liberty Insurance Company of NY, Houston Casualty Company, Cigna, Imperium Insurance Company, American Empire Group, Brownyard Claims, Fireman's Fund Insurance Company, MTA Bus Company, Utica First Insurance Company, Scottsdale Insurance Company, Aspen Insurance, Glatfelter Insurance Group, Trident Public Risk Solutions, RLI, Allied World Insurance, Crum and Foster, Markel, Axis Capital, Philadelphia Insurance Companies, Allianz, Atlantic Casualty Insurance Company, Consolidated Edison and Houston International Insurance Group. MDAF is a well-rounded firm, with the ability to furnish a quality defense of all litigation matters, both simple and complex, from pleadings through trials and appeals. The firm is also experienced in all forms of alternative dispute resolution such as arbitration and mediation. MDAF currently employs over 50 attorneys and was named the largest minority owned law firm in the State of New York by the New York Law Journal. Please explore our web site to learn about our practice areas and experience, and feel free to contact us to learn more.